The rusty-coloured ironstone which was mined locally comprised of only thirty percent iron when smelted, it came in several shapes; balls, nodules, dogs tooth and so on referring to its physical shape. It occurs as 'Siderite' or iron carbonate and several seams or 'rakes' occur between the main coal seams. Ball, Nodule and Dog Tooth Ironstone. (ANB). A survey document from a competitor of the Smith family enterprises, the Barrow family (later to become the Staveley Company) shows that the Inkersall Rake ironstone was being mined in the Duckmanton and Staveley areas at a rate of 1,932 tons per acre. (24th. March 1840). From the inventory of factory produced wares it would seem that the particular form of iron produced could not or was not made into steel. It was used mainly for forging and casting of large industrial machinery parts for lead and coal mining operations as well as for use in the munitions industry. When iron ore was discovered in Northamptonshire it was found to be of a higher quality and purer than the poor 30% yielded by the local ironstone and therefore by the middle to late nineteenth century it had completely replaced that mined in the area. (I seem to remember reading that it was some 60% iron content). Farey writing in 1811 refers to ironstone lying in flat balls in the coal shales sometimes looking like a paved floor. The beds of ironstone in the coal shales are referred to as Rakes where they basset or outcrop at the surface. Many local fields contained areas that were mined following the seams as they dipped underground from the surface. 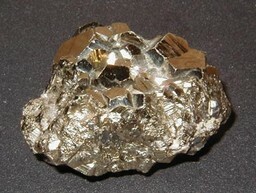 Brasses or Drosses, which are lumps of Iron Pyrites could be found in several local collieries. The best of which were selected and sold on to local makers of Copperas, Green Vitriol or Sulphate of Iron. Two such firms existed in Brimington. The Iron Pyrite or iron sulphide was heated to produce the iron sulphate (Iron can also be treated with sulphuric acid to produce iron sulphate) which could then be used in the manufacture of inks, in wool manufacture as a mordant. A mordant being a substance added to the fibres before dyeing to help the dye adhere to the fabric, it may also dye the fabric. The chemical could also be added to the ornate pottery and glass water filters of the Victorian era as a water purification agent which was an alternative to aluminium sulphate. Several of the seam outcrops can be charted on the railway cutting from Arkwright to Calow at SK 47/57 425704. The Brimington Anticline is a natural local phenomena which aided the local coal mining industry giving easy access to the coal seams. It is caused by an uplift in the strata and causes the coal seams to outcrop east and west of a ridge that runs from Brimington through Calow to Arkwright. The seams then dip down to the east and west and initially coal was easily extracted from the outcrop edges of the seams and was worked in this way for hundreds of years prior to the nineteenth century. Drifts or adits into the coal were later worked as the easy coal had been taken. It was into the outcrop of these seams that such collieries as Arkwright and Calow Main were made along with several small short term collieries at Calow and Brimington. There are other anticlines in the vicinity which affect the strata in the same way. The west of the Anticline dips into the lower coal measures which are usually shallow in such areas as Brampton and Ashgate, to the east the seams are in the middle coal measures which are much thicker in section but run deeper the further east you go hence collieries at Markham and Bolsover. It was usual at Markham and Bolsover to have uphill or downhill roadways to the face and a level seam to work on the face. One exception being L101's face in the Deep Soft seam whose gates were on the level and the face ran downhill from the air gate or return airway. Siderite, Ironstone. (ANB). Ball, Nodule and Dog Tooth Ironstone. (ANB).